When our nations’ founders drafted the Bill of Rights, comprising the first ten amendments to the Constitution, they spelled out rights that are to be extended to all citizens. Not just those who are privileged, or those who have money, or even those who don’t have money. Not just those who belong to select organizations or groups, but to all citizens. Consequently, when they penned “Congress shall make no law respecting an establishment of religion, or prohibiting the free exercise thereof; or abridging the freedom of speech, or of the press; or the right of the people peaceably to assemble, and to petition the Government for a redress of grievances,” those were rights to be universally enjoyed and protected. 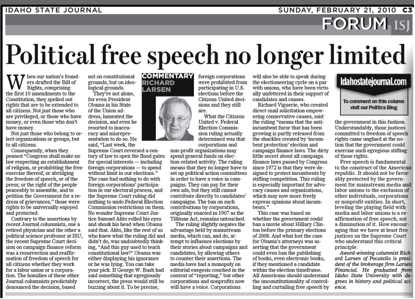 Contrary to the assertions by recent Journal columnists, one a retired physician and the other a government professor at ISU, the recent Supreme Court decision on campaign finance reform was a resurrection and reaffirmation of freedom of speech for all citizens whether they work for a labor union or a corporation. Their homilies predictably denounced the decision, based not on constitutional grounds, but on ideological grounds. They’re not alone, for even the President in his State of the Union address, lamented the decision, and even he resorted to inaccuracy and misrepresentation to do so. He said, “‘Last week, the Supreme Court reversed a century of law to open the flood gates for special interests – including foreign corporations – to spend without limit in our elections.” The case had nothing to do with foreign corporations’ participation in our electoral process, and the Supreme Court ruling did nothing to undo Federal Election Commission restrictions on them. No wonder Supreme Court Justice Samuel Alito rolled his eyes and shook his head when Obama said that. He, like the rest of us who knew what the ruling did and didn’t do, was undoubtedly thinking, “And this guy used to teach constitutional law?” Obama was either displaying his ignorance or he was lying. You can take your pick. If George W. Bush had said something that egregiously incorrect, the press would still be buzzing about it. To be precise, foreign corporations were prohibited from participating in U.S. elections before the Citizens United decisions and they still are. What the Citizens United v. Federal Election Commission ruling actually determined was that corporations and non-profit organizations may spend general funds on election-related activity. The ruling means that they no longer have to set up political action committees in order to have a voice in campaigns. They can pay for their own ads, but they still cannot contribute directly to candidates’ campaigns. The ban on such contributions by corporations, originally enacted in 1907 as the Tillman Act, remains untouched. The ruling slightly negates the advantage held by main-stream media, which can, and do, attempt to influence elections by their stories about campaigns and candidates, by allowing others to counter their assertions. The media have had a monopoly on editorial exegesis couched in the context of “reporting,” but other corporations and nonprofits now will have a voice. Corporations will also be able to speak during the electioneering cycle on a par with unions, who have been virtually unfettered in their support of candidates and causes. This case was based on whether the government could ban a movie about Hillary Clinton before the primary elections of 2008. And what lost the case for Obama’s attorneys was asserting that the government could even ban the publishing of books, even electronic books, if they mentioned a candidate within the election timeframe. All Americans should understand the unconstitutionality of controlling and curtailing free speech by the government in this fashion. Understandably, those justices committed to freedom of speech rights came unglued at the notion that the government could exercise such egregious stifling of free speech rights. Free speech is fundamental to the construct of the American republic. It should not be favorably protected by the government for mainstream media and labor unions to the exclusion of other individuals, corporations, or nonprofit entities. In short, leveling the playing field with media and labor unions is a reaffirmation of free speech, not a diminution of it. How encouraging that we have at least five justices on the Supreme Court who understand this critical principle.